Unlike Major Kong in Dr. Strangelove, I wasn’t about to climb onto the bomb, aka The WiseGuy, and ride it down to the eventuality of mushrooming into nothingness. The WiseGuy spent most of the meet at Turf Paradise re-examining programming to find a better evaluation technique in picking the winners using the exclusive ROD handicapping we developed. That didn’t work well in the beginning and SOMEHOW the original scheme was lost, overwritten and forgotten. Then things went spiraling downward and tickets were hitting the floor like someone had shot a white goose with a shotgun in the clubhouse. This disaster started in early November of 2011 and after hitting some little ones for 50 bucks every so often I thought I’d go back to square one. That’s when I discovered that changing the program was a bad idea, a really bad idea. So after all these months of excruciating trial and error to get back to the original formulation schemes, we finally made it about a couple of weeks ago and things began to look up for the WiseGuy. What most are not aware of is how the ROD works and how it’s very much like a combination lock. You have to have the sequence in order or it just won’t open. ROD requires a certain formula of deceleration rate to be the start of the evaluation. This picks the races. The next formula picks the best two most similar races for that horse which is racing today. The next formula picks the best race of those two and isolates that particular race. The next formula pits all the horse’s best race against each other horse’s best race in the past. The next and final formula picks the best three horses for today’s race card. So you can see that if there are nine ROD formulas to choose from in the combination, you must have them stacked correctly in sequence or you just can’t open the lock. Once its open, it is then we apply the trend to see how deep the closers are and validate the selections on the Bet Sheet. The weather warmed and the WiseGuy started hitting again on a race at Turf Paradise. The Mayor had abandoned Turf earlier and was doing his handicapping on Santa Anita and having pretty much the same results as I was having. Something clicked on that particular race as I had just tried another combination the day before and saw that the patterns were becoming clearer. I was on track to the original combination. The Mayor and I could see a what we now call, ‘The Trend’ once we began applying a process toward the Trending Sheet I developed the month before because I was sick and tired of interpreting the running lines of the Race sheets that are in the background of the Bet Sheet. Well instead of going to the track on Saturday I was going to tend to my ground and clean up the pool and the garden. I had just finished trimming the tomato plants when the text from Cal arrived. It was in code. I didn’t know why until my brain cleared from the exhausting heat of Arizona and was then able to conjured up what the code meant. “Had theP580 k”. Okay so it looks easy but I wasn’t sure exactly what it meant as I had talked to The Mayor earlier and told him the P4 at Santa Anita was anyone’s guess, including the WiseGuy’s. Then it hit me. What Pick 5 I asked myself as I turned off the watering hose. Certainly the carryover of $3500.00 at Turf was not near that. 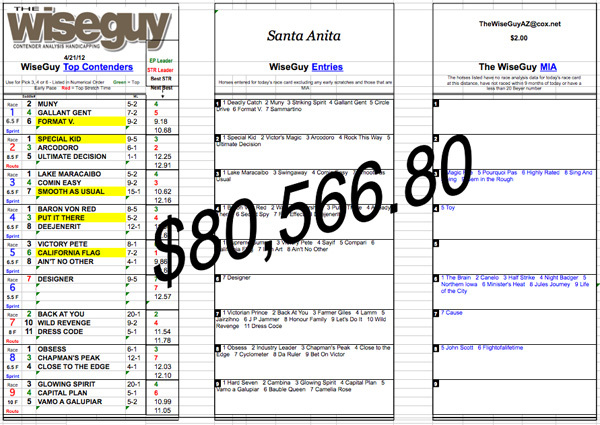 It was Santa Anita and I ran into the house and checked my TVG account and there it was. $1.00 Pick 5 (5 of 5). . . $80,566.00 Samolians. Well the rest is history and my head is still throbbing from the small celebration at Gallaghers. Get this, I hear another Arizona group hit it too for 40K. I think things are brightening up for ROD handicapping so the WiseGuy can close the bomb bay doors for now. Previous Previous post: What is ROD handicapping?